almost completely evaporated, about 2 minutes. Stir in the tomato paste until well incorporated. Add the syrup, vinegar, mustard, paprika, Tabasco, and pepper, and simmer for 2 to 3 minutes, to meld the flavors and thicken the sauce slightly. Remove from the heat and set aside. 4. Brush the cooking grates clean. 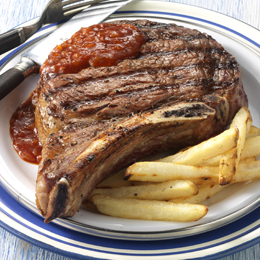 Grill the steaks over direct high heat, with the lid closed as much as possible, until cooked to your desired doneness, 8 to 10 minutes for medium rare, turning once or twice (if flare-ups occur, move the steaks temporarily over indirect heat). Remove from the grill and let rest for 3 to 5 minutes. Serve warm with the sauce.